I’d like to introduce you to Sabrina Massa, 2014 SHOUT OUT! cast member! SABRINA MASSA is a sophomore at Kaneland High School. During the school year she is involved with several activities including poms, theatre, and choir at the high school. Since they began, she has been involved in the Kaneland Art Initiative’s summer musicals and just last winter she was in The Laramie Project, KAI’s first winter play. Sabrina is very excited to be a part of KAI’s first SHOUT OUT! and she hopes you all find the speeches to be interesting and enlightening as she did. 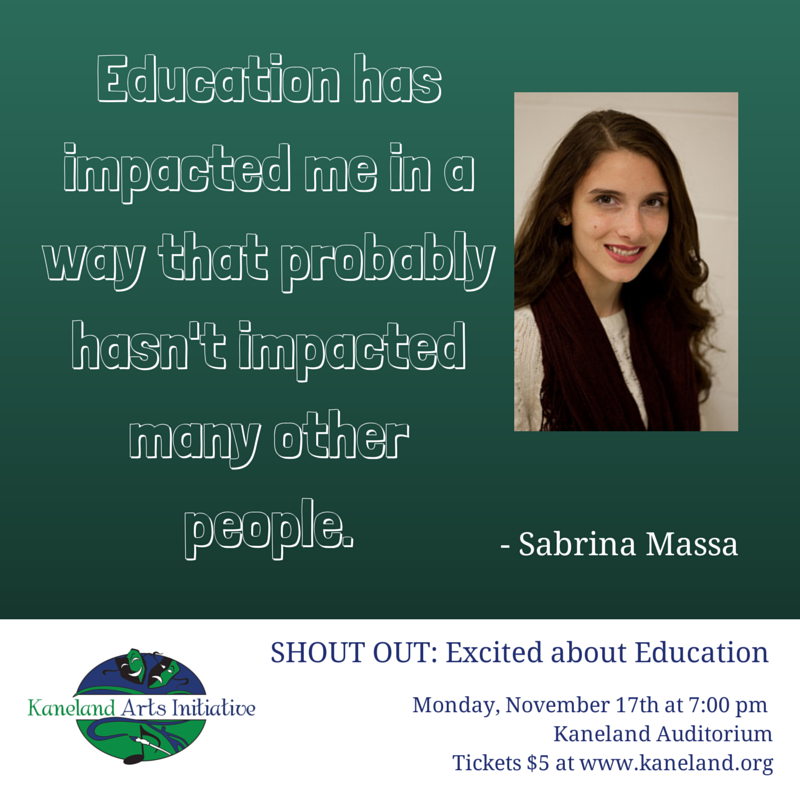 Sabrina is a very busy young lady at Kaneland High School, so we were thrilled that she had a moment to answer our questions for her spotlight. What year are you in school? I am a Sophomore at Kaneland High School. What do you want to be when you grow up? I want to be a lawyer. Do you have a favorite story that you aren’t telling us at the SHOUT OUT? I was picked out of 42 students to lay a wreath with three other students on the Tomb of the Unknown Soldier in Washington D.C.
Who is your favorite teacher and why is he/she a favorite? All of my music education teachers are my favorite teachers, because they have been not only the best teachers I’ve ever had, but they’ve been the most passionate, caring, and lively teachers I’ve ever met. What is your LEAST favorite subject in school? My least favorite subject is science because I never understood it and I was never interested in science. Do you have any teachers that you would like to hear at our next SHOUT OUT? No specific teacher, I think any of them would be interesting. What excites you about education? Meeting new people and feeling the feeling of accomplishment once another school year is completed. On Monday, November 17th, come see Sabrina read her speech, My Square, in the Kaneland Auditorium. The show begins at 7pm and tickets are $5 each. Tickets may be purchased online (www.kaneland.org) or at the box office.